It's rhubarb season and that makes me so happy!! I love rhubarb especially because of its tartness and it's luscious red color that leeches into sauces and baked goods. I love that you can use it in sweet dishes as well as savory! Here, I'm sharing my secret with you: if you've run out of lemons, add a few chunks of rhubarb to your stew and it will add a welcome tanginess! So when it's rhubarb season, I always buy extra rhubarb, wash it, chop it into even chunks and freeze them. They last a good year in the freezer and can be used whenever your heart or mind craves rhubarb! So convenient! According to the Rhubarb Compendium, rhubarb is rich in potassium and vitamin C. Potassium is a necessary mineral that helps control blood levels in our body with the help of sodium (WHfoods). Vitamin C is an antioxidant that's necessary to help the body absorb iron, among other things like maintaining eye and brain health, cholesterol levels and DNA (WHfoods). Note that rhubarb leaves are toxic for humans so just use the stalks! My sister-in-law grows rhubarb in her garden and says that the more you pick it, the more it grows. Last week we visited her garden and got to eat raw rhubarb stalks and oh my goodness, freshly picked thin rhubarb stalks are incomparable -- what a treat! 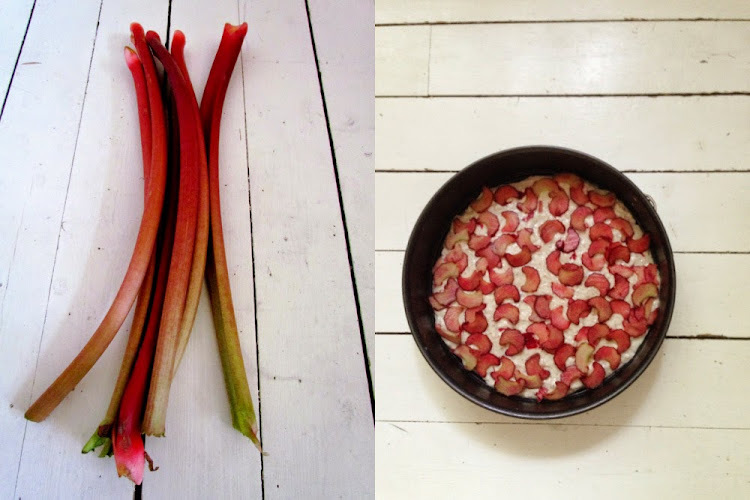 If you can't grow rhubarb, you can find it at your local farmers market or even supermarket. Now onto the cake. I love experimenting with vegan recipes because I want to consume less dairy and eggs -- there is a lot wrong with the industry and I worry about how the animals are treated. Besides, some people have allergies and can't eat eggs, so it's always good to have other options. Plus it's a challenge to go beyond eggs and see what you can create without them! I've been perfecting this vegan cake recipe for about a year now and I think it's ready to share. It's moist and fluffy, so versatile, and on the healthier side. It doesn't have any eggs, so I use flax powder or chia powder instead. It doesn't have any butter, so I use canola / rapeseed oil instead. Instead of cow milk (which you could use), it uses plant milk like almond or oat. The crumble also uses coconut oil instead of butter, but if you want, you can go ahead and use butter. After attending university, I've jumped on the rye bandwagon. Why? Firstly, it's grown locally for me living in the "rye belt" here in Sweden. Secondly, it has a myriad of health benefits: It's high in fiber, which means it keeps you fuller longer and helps with regular bowel movements and weight loss; It's rich in magnesium, which helps neutralize blood sugar -- excellent for diabetics! Moreover, it contains phytonutrients that help prevent cancer and heart disease! (Source: Whfoods). Plus, even when you use refined white rye flour, it has more nutrients than wheat flour! Although it doesn't have as much gluten as wheat flour, it has enough for cakes and cookies, so go ahead and experiment using rye in your kitchen! I hope you try this rye rhubarb cake and let me know what you think of it! It received the highest likes on my humble Instagram feed so I thought a recipe was necessary to share! Oh and if you're on Instagram, let's be friends, I'm @shootsandtendrils. Enjoy! You can skip the crumble topping if you'd like a simpler cake but the crumble does make it extra special and crunchy! 1. Preheat the oven to 180C / 350F. Line a spring-form pan or 9-inch round cake pan with parchment paper and grease the sides. In a bowl, mix in the milk, flax powder, oil, vinegar, sugar and vanilla extract. In a separate bowl, mix the flour, baking powder, baking soda and salt. Then combine the wet with the dry, mixing just to combine (do not over-mix or it will produce a tough cake). Pour the batter into the spring-form pan and even the surface. Arrange with the rhubarb slices on top. 2. Make the crumble topping: Mix all the ingredients together with your fingers. Crumble onto the rhubarb. Bake for 15-25 minutes, until a wooden skewer inserted into the center of the cake comes out clean. Cool the cake before cutting. It tastes even better the next day! Enjoy!